The second novel in the upcoming Stark House volume of reprints from Lion Books is THE MAN I KILLED by Shel Walker, who was really Walt Sheldon. This fast-paced crime novel is the only time Sheldon used that pseudonym. The narrator has a pseudonym, too. He calls himself Lew Ross but makes it clear that’s not his real name. The alias is because ten years earlier he killed a man in a bar fight and went on the run. The law has never caught up to him in his adventurous life since then, but as this novel opens he’s come back to the unnamed city in the American Southwest where his crime took place. The scene of that crime is now a much fancier nightclub and gambling joint run by mobster Marty Evans. Lew meets a girl there and falls for her, but he has a tendency of getting in trouble and before you know it he’s up to his neck in a murder frame, complete with beatings from the cops and the gangsters alike. 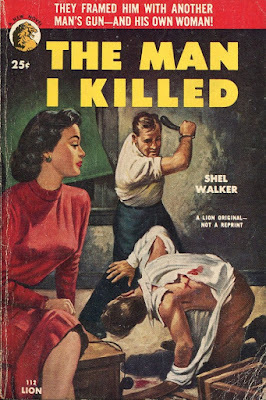 Anybody who’s read many hardboiled crime novels from the Fifties will have a pretty good idea what’s going to happen in this book, but the real pleasure in reading THE MAN I KILLED is Sheldon’s crisp, literate prose. The story moves along very fast, Lew and both of the beautiful girls he encounters are likable characters, and the antagonists on both sides of the law are suitably detestable, although a couple of them (a police detective and a former college football star who now works as muscle for the mob) have more depth to them than you might expect. This is actually the first novel by Sheldon that I’ve read, although I’ve seen his books around for many years and have a few of them on my shelves. I enjoyed it very much and will be checking out more of his work. I've read several of Sheldon's books, all entertaining. I've read two, I think, and both were good. The other one was an epistolary novel, the only crime PBO I know that's narrated solely through letters, diaries and other notes.